Like ledger flashing, installing brick flashing is not difficult to do and will extend the life of your front porch or deck. Water and ledgers don't mix and that is why most fail. 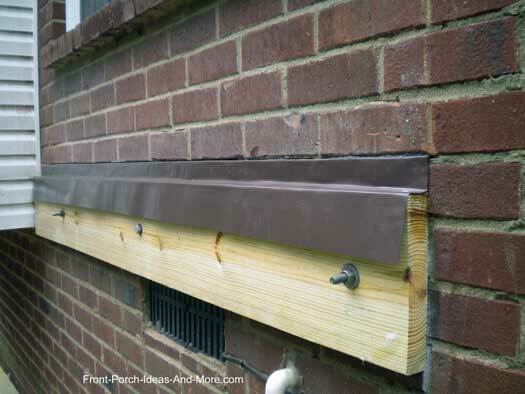 To prevent wood rot it is important to install flashing over your ledger board properly. 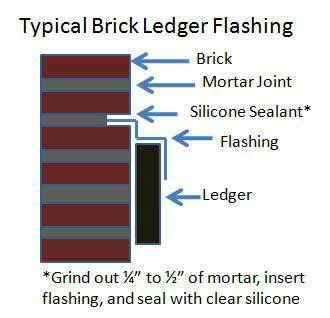 Brick ledger flashing covers the ledger and prevents water from touching it just like flashing under siding; however, the process for installing it is a little different. We'll walk you through the basic steps so you'll have a very good idea of how it is done whether you decide to do it yourself or hire a licensed contractor. And if you do hire a contractor, make sure they properly add brick flashing to your porch or deck. NOTE: Always check with your local building codes department before installing a brick ledger board. Mark a line for the ledger board. Find a grout line that is approximately 2 inches or more above the ledger board line. 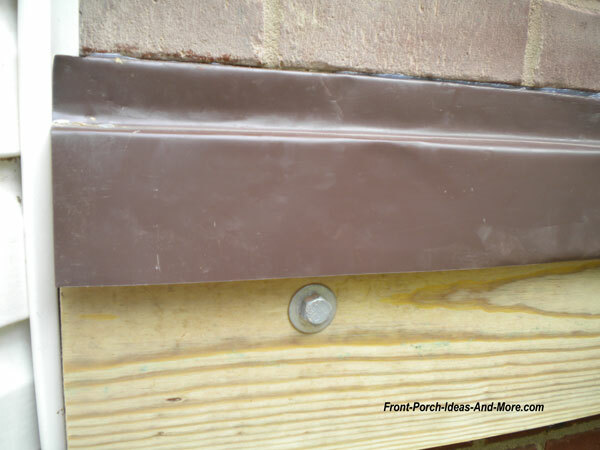 This line ensures your flashing will be above the actual porch floor or deck flooring material. Grind out 1/4 to 1/2 inches of grout about an 1/8th inch wide. I like to use a fiber blade on a circular saw. You can use a diamond blade but for small jobs a fiber blade is much less expensive to use. TIP: When using a fiber blade understand that the blade will wear down quickly. On long cuts it will be necessary to readjust the depth of the cut to ensure you get a consistent cut line. Use a cold chisel and hammer to chisel out the grout line at corners. Clean the cut line with a brush. Purchase or make the flashing. You may be able to purchase flashing meant for brick work or in some cases you can modify Z-track flashing to work. 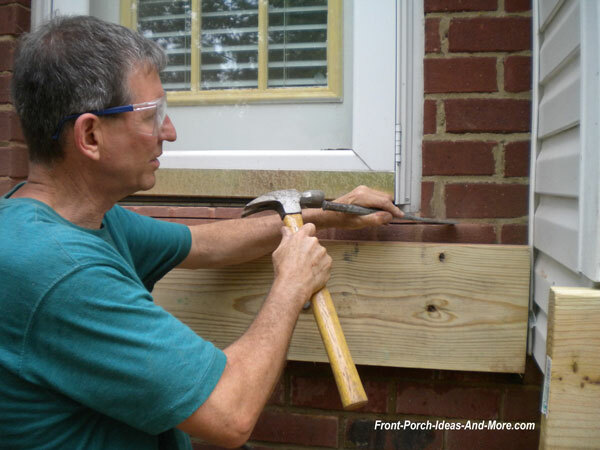 Install the ledger board according to local building codes. Refer to our ledger board section for important considerations regarding the proper installation of ledger boards. 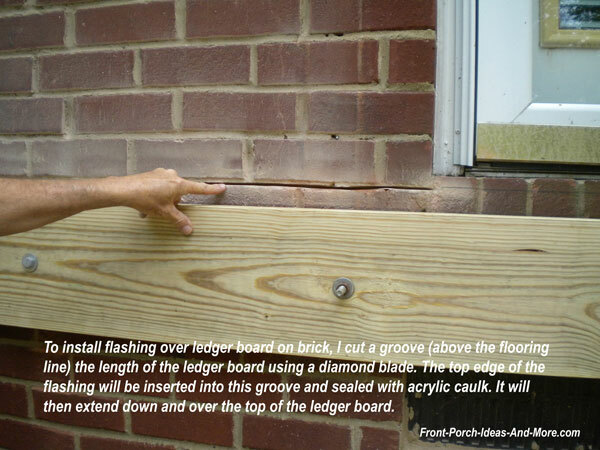 CAUTION: You must never attach a ledger board to the brick veneer on a home. There is a space between the brick veneer and the sheathing of your home. Ledger boards must be securely fastened to your home's framing. Place a generous amount of silicone caulk in the cut line. Insert the flashing into the cut line and over the ledger board. Please see our ledger flashing section for a detailed photo of proper flashing placement (although brick flashing will be a bit different). Do not nail into the flashing. If you must, seal any openings with silicone caulk. Sandy, from Long Island, asks how high could her porch floor be installed on a brick wall. See our response about the height of a porch floor. See our information about flashing on siding - a must see for most porch builders!